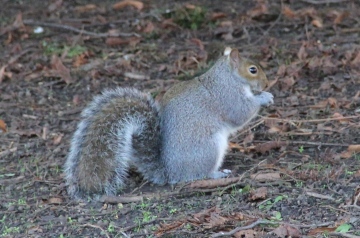 Grey squirrels Sciurus carolinensis were introduced to the UK from the USA in the late 19th or early 20th century. They're now widespread throughout England south of Cumbria and Wales, and common in local pockets in Scotland. They have grey fur and often sit upright with their large bushy tails arched over their backs. Grey squirrels are active during the day, foraging for food in trees and on the ground, often visiting gardens. In the autumn they spend time storing nuts to eat during the winter.